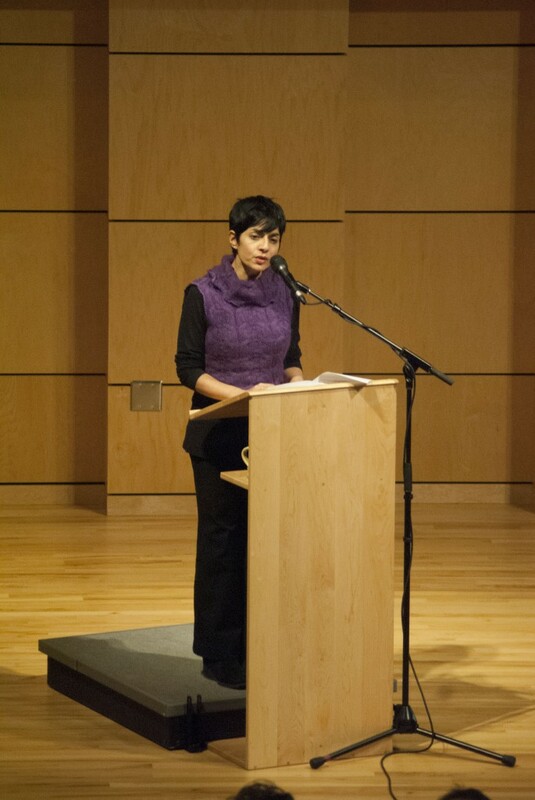 Simran Sethi, a journalist, strategist and educator, spoke in Reith Recital Hall on Tuesday evening about the intersections of faith, food, science and business as they relate to eating well–both for personal and global health. Sethi’s presentation also came as part of EcoPAX’s Earth Week celebrations, with a special event each day of this week. Other EcoPAX events include a field trip to a landfill today, Dorm Floor Shower Olympics on Friday and an Earth Hour gathering in the Connector on Saturday night. Known as one of the top 10 “eco heroes” by the UK’s Guardian, Sethi examined the role of agriculture and consumption for people of the Christian faith. Sethi, a follower of Hinduism, claims that food is sacred, and that humanity must treat the process of making food the same way. “We will reap what we sow,” Sethi said. “We stuff our bodies while our souls cry out for nourishment.” Sethi also explained that we have very little understanding of where our food comes from and how it is grown. In the mid ’90s, when researchers began to apply genetic modification to agriculture, the implications were unknown. As technology has developed, plants have been modified to grow and act in certain ways. But are these genetically modified plants considered equal to normal plants? The Food and Drug Administration labels these modified plants as GRAS, or “Generally Regarded as Safe,” since their DNA is over 99 percent the same as their unmodified counterparts. The GRAS label does something extremely important for the creators, said Sethi. It gives the creator an opportunity to patent the plant, resulting in seeds being a product of corporations rather than of nature. According to Sethi, the U.S. agricultural economy is built mostly on corn, an extremely water-intensive crop, and leaves the single-crop reliant economy vulnerable. Meanwhile, an overwhelming majority of corn and soy are genetically modified and primarily used to feed cattle or as raw materials. “We have been guinea pigs in real time,” Sethi said. Since the FDA has given genetically modified plants the GRAS label, testing for potential negative reactions from them was never deemed necessary. In the U.S., according to Sethi, around 18 percent of the population is struggling for food, while 40 percent of our daily food consumption is wasted. She went on to say that as food insecurity increases, so does the general obesity rate. This week Goshen College students are celebrating Earth Week with a special event on each day. -Saturday, March 23: Earth Hour and gathering in first floor Connector, 9-10:30 p.m.